Written and directed by Guy Unsworth, this hilarious play is a reworking of a classic episode of the BBC sitcom and I have to admit the sound of the show’s iconic theme at the start of the play transported me back to my childhood where I watched the programme with my family. Set in the 1970s at the Spencer’s house the play tells the story of Betty’s (Sarah Earnshaw) attempts to tell husband Frank (Joe Pasquale) that a baby is on the way. The play’s five strong cast are excellent. Joe Pasquale gives a faultless performance as Frank, showing great comic timing in the delivery of his lines (he particularly excels during a couple of Frank’s tongue-twisty monologues). Pasquale has great chemistry with Sarah Earnshaw who plays Frank’s long suffering wife, Betty. Earnshaw is also brilliant when delivering her lines. Susie Blake is outstanding as Barbara Fisher (Betty’s mum); Blake delivers her lines perfectly with great comedic acting (the sight of her as tipsy Barbara will live long in the memory). Moray Treadwell (dual roles Terry Luscombe/David Worthington) and Pasquale are a great double act throughout the show. David Shaw-Parker (Father O’Hara) is solid as Betty’s confidant, and Chris Kiely (dual roles Desmond James/Constable) ably supports the other characters with a good performance. The production is well-staged with plenty of visual stunts and mishaps. Unsworth’s well paced direction is complemented by a script which crackles with plenty of laugh-out-loud moments. Simon Higlett’s set and Matt Haskins’ lighting are impressive, brimming with clever special effects which simply add to the enjoyment of the piece. Ian Horrocks-Taylor’s sound is excellent and includes a brilliant 1970s soundtrack; the ‘three Frank’s dance’ – and the energetic cast dancing to Mud’s Tiger Feet are well choreographed by Jenny Arnold. I laughed all the way through this wonderfully entertaining and hilarious play. Joe Pasquale is a national comedy treasure and is one of the hardest working and top-selling live comedians in British comedy today. He exploded onto our tellies in New Faces and went on to win I’m A Celebrity Get Me Out of Here and host The Price is Right. Susie Blake’s incredible career includes Wicked, Blithe Spirit and she had us in stitches in The Victoria Wood Show for the BBC. 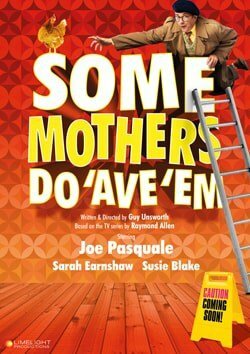 Some Mothers Do ‘Ave ‘Em is directed by the award-winning Guy Unsworth.